Size: 5.3" x 3.9" x 0.25"
While Sharp claims the EL-8026 as the world’s first calculator USING solar cells instead of batteries, share we within the Datamath Calculator Museum a different opinion and refer the Teal Photon as world's first calculator OPERATED by solar cells. The EL-8026 recharges its internal batteries with solar cells installed in the back of the housing, while both the Teal Photon and this EL-825 can be operated in bright light. Dismantling this EL-825 manufactured in 1979 reveals some secrets of the project. The calculator is actually based on a credit-card sized, battery operated calculator with the batteries replaced by the solar cells. Please notice the two LED's (light emitting diodes) installed in one of the battery compartments, they limit the maximum voltage provided by the solar cells. We still find this approach in solar powered calculators manufactured in 2011! 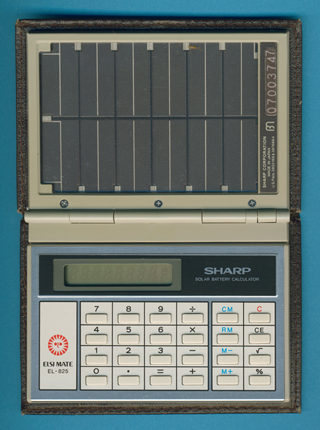 Read more about Sharp Corporation’s Calculator Innovations. It took another two years till Texas Instruments introduced with the TI-1766 their first "Solar and Light Power" operated calculator with much smaller solar cells. © Joerg Woerner, February 3, 2011. No reprints without written permission.